Refresh your spirit in Lac du Flambeau! Located in Wisconsin's Northwoods, explore it's chain of lakes or paddle 71 miles of rivers and streams. 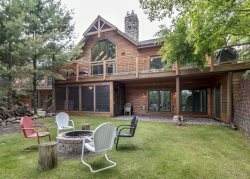 Known as one of the top birding destinations in Wisconsin and for it's premiere fishing, Lac du Flambeau is the perfect vacation destination for outdoor adventures and quiet relaxation at a cozy vacation rental.